We have all heard horror stories about experiences on eBay. The good news is for the most part, over the last 10 years, eBay has become a pretty safe environment for buyers. One way you can make it even more safe is to look for sellers with the above logo/status. 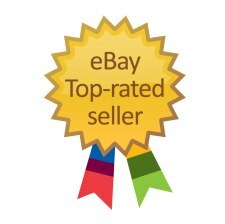 Top Seller Status is reserved for eBay sellers that consistently receive the highest scores in a number of areas related to customer satisfaction. Up until a few months ago, I didn’t even know what the logo meant…it just got lost in the barrage of images on the typical eBay listing. However, since I made Top Seller Status myself in July, I have begun to look for the logo, and if I have a chance to buy an item from more than one seller, now I will always choose the one with Top Seller Status.